Read my Office Info and Patient Testimonials! I am an Ophthalmologist, a medical physician who performs eye examinations, diagnosis and treatment of eye conditions, and performs eye surgery. It is a great pleasure to service the patients in Greater Cincinnati and Northern Kentucky. My background has a local flavor attending Moeller High School as well as the University of Cincinnati for undergraduate, medical and ophthalmic training. I am one of the few ophthalmologists in this area to have been blessed with such strong roots to my area of practice. My office is in Madeira just a few minutes away from Kenwood. 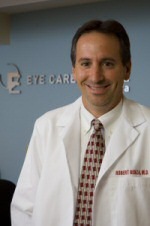 In the past 6 years, I have been the president of our 10 physician group at Eye Care Associates of Greater Cincinnati. During this time, I have been a board member at Evendale Medical Center, one of the most successful physician run centers in the country. I feel very fortunate to perform weekly surgery at such a state of the art facility. I have many medical affiliations including the American Academy of Ophthalmology, American Society of Cataract and Refractive Surgery, and the Ohio Ophthalmological Society. I have always enjoyed teaching fellow resident physicians, staff and patients. Through the University of Cincinnati, I mentor medical students and residents who want to learn more about the practice of medicine and ophthalmology. This is why I have a great interest in educating patients on a larger scale via blogs on all 500 .MD City Web Sites.